Two thirds of public transport journeys are made by bus and millions of people rely on them to access work, education, health services, shops, friends and family. They also reduce congestion and pollution and contribute to local economies, yet buses are increasingly under-funded and consistently overlooked by policy makers. Bus Users’ Manifesto was originally launched ahead the last General Election, but according to Claire Walters, Chief Executive of Bus Users, the situation for UK buses is reaching crisis point: “Since we first launched our Manifesto there have been significant changes in central and local government and within the Department for Transport, and last month the long-awaited Bus Services Act was finally passed by Parliament. "Yet between 2016/17 funding for buses was cut by £30million and over 500 bus routes were reduced or cut completely*. Without buses people can’t access work, education, training or essential services, and in the long-term this will cost central and local government far more than they save." 10. 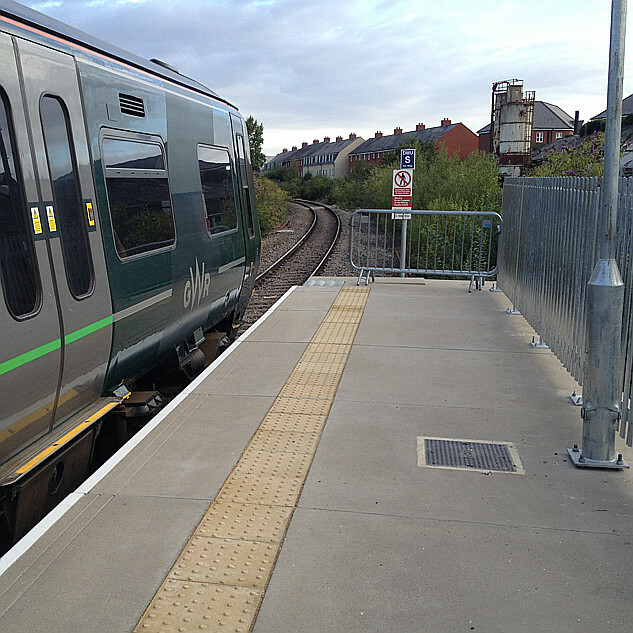 A simplified fares system across all modes to support passengers and remove barriers to travel. Bus Users' Manifesto. Splendid. Promoted by the Autobus Route Society of England, I trust? I think this point in the manifesto would financially cripple many council supported services. I've seen all of these on buses before, but not all three at the same time. I didn't see it in the manifesto, but being able to know in advance how much your bus fare will be would be good. Some operators are better than others online. National Rail, GWR and other TOCs can tell you your train fare and offer to sell it to you, why not Traveline, Google etc with your bus fare? I've been on a bus that has Wi-Fi, a next-stop information screen (with audio announcements) and 3-pin power sockets. I don't think the power sockets have worked for years though and if I recall correctly there are only 4 of them on the 40-seat bus. The legroom however (apart from a handful of seats, which I always aim for) is completely inadequate for the 1-2hr trips it tends to work, let alone the even longer run between Aberystwyth and Cardiff it was built for (it didn't have Wi-Fi in those days). I think the next-stop system is non-functional almost is often as it is running, not helped by the fact the service is split-registered with the destination shown on the outside of the bus sometimes actually being the halfway point rather than the bus' true destination. When the halfway point is reached I think the driver changes the external display to show the final destination, which seems to reset the internal system (sometimes it comes on at this point having been silent and vice-versa). The system is however rather pointless since the bus is hail-and-ride and the driver will stop anywhere it is safe to stop (at least when not in a built-up-area), something I use to my advantage. Also, a few weeks ago one passenger, obviously unfamilar with the area and/or the system, heard their stop announced and got up to alight; the driver correctly pointed out that the stop was miles away yet, advising the passenger to return to their seat. In other words, these audio-visual systems are much-less suited to rural bus services than rail services which have a finite number of stops. The other day I saw that the National Assembly for Wales has received a petition with 1,239 signatures calling for the Welsh Government to put an end to school traffic on public bus services. Apart from the fact school and college traffic tends to swamp buses, leaving them overcrowded, I have previously considered that perhaps the opposite action should be taken; making school buses available to all as normal public bus services. It could open up areas that currently have no public transport and in other cases could reduce the total subsidy requirements by running fewer buses (less need for duplication with public buses and dedicated learner transport running on similar routes). The petitioners are citing 'stranger danger' but, on your first day at a new school, wouldn't most of the other pupils at school also be strangers. Ok, children are generally less capable of doing harm to others than adults, but with CCTV on buses these days is the danger that much greater anyway? On timetable coordination, it would be good if the schools could coordinate with the buses in some cases; one bus my brother might be using today has to hang around for fourty minutes, making the journey take much longer and disrupting what is normally a clockface timetable. This is especially true with long routes that coordinate with one school/college but have others on their route. Don't DOO it, keep the guard (but it probably wouldn't be a bad idea if the driver unlocked the doors on arrival at calling points). Much of the philosophy of the manifesto relates to improving things for bus users, which would cost money; the plan would (I suspect) be that the improvements would attract extra passengers that would recoup that extra money. Seed funding would probably be needed and it might end up that the overall support cost was higher, even if the support cost per journey was lower. I too find it hard to work at a laptop on a bus but can do so (19:30 Paddington Chippenham excepted!) on a train. 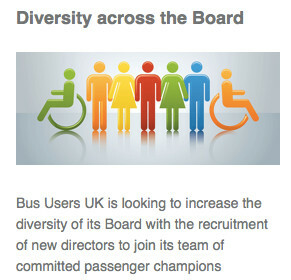 Bus Users are seeking board level director(s) at present - closing date 26th Feb 2018. I took a close personal look at this - including discussions with friends and family and concluded that although I meet all the mandatory and desirable elements, I will not be taking it further. Campaign for Better Transport need a CEO too. Don't want it to get lost in Bus Users - that would be akin to throwing out the baby with the bath walters. - that would be akin to throwing out the baby with the bath walters. I thought Dame Julie was from Birmingham. You could always have said Bath walkers or walzers ! Picking up another's typo and then misspelling 'waltzers'. But is there a chance that the original spelling was done like that either intentionally or on purpose? Has anyone been in touch with Bus Users in England recently? How are they doing? Following on from an incident that I was alerted to by a Wiltshire Councillor who gave me as a contact (!) who might know who to go to once a complaint to a bus operator had failed, one of my suggestion was Bus Users. A phone call to them by the aggrieved party brought the reply that the complainant was very welcome to document and send in the issue, but they are snowed under and it would be 3 months before it's look at. Really? - was my contact being mis-informed, kicked into the long grass, did (s)he misunderstand, or are they reall in a mess?